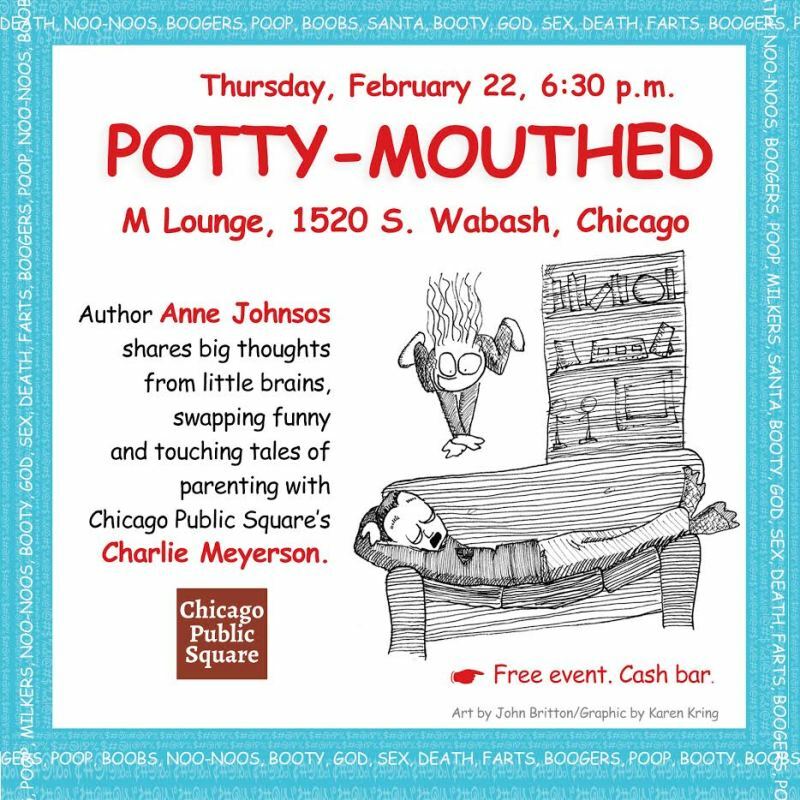 "​POTTY-MOUTHED: Big Thoughts from Little Brains​,​"
Cocktails start at 6:30 p.m.
Anne will be joined by ChicagoPublicSquare.com publisher Charlie Meyerson, who’ll share excerpts from journals he and his wife kept while raising their three sons to adulthood. There'll be a cash bar. POTTY-MOUTHED will be on sale for $20. Suggestion: Eat before you come. No food is served at M Lounge, though you can bring some in or order out. Anne Johnsos is an award-winning journalist, former WGN Radio producer, as well as former TV anchor and Northwestern professor. After years of recording the ways her kids interpreted the world, she reconnected with a fellow former performer from Yale, John Britton, who happens to be an illustrator, and POTTY-MOUTHED was born. Even if you've not heard of Charlie Meyerson, if you're a WXRT, WGN or WBEZ listener, it's likely you've heard him. Charlie's devoted a career to bringing news to the Chicago area on-air, online and in print. Perhaps you've read his work for the Chicago Tribune. Charlie’s the winner of dozens of journalism awards—including a national 2016 Edward R. Murrow Award for online audio investigative reporting. You can read his take on the news of the day weekdays at ChicagoPublicSquare.com or in your inbox. Keeping it in the family: M Lounge is owned by Sun-Times columnist Maudlyne Ihejirika's sister, MaryAnn Marsh, to whom we're grateful for giving Anne and Charlie a place to play and share. Additional thanks to ChicagoPublicSquare.com and The Kring Group.